The chassis is an existing MAN TGL truck chassis with bolted and riveted steel frame, not a chassis cowl, and has been specially adapted for bus use. The 4×2 TGL is available with 7.5, 10 and 12 tonne GVWs. The 10 tonne is the standard offering and the vehicle that was available for inspection at the press launch, but I am reliably informed that the 12 tonne version is imminent. It will be offered with the Pulse as a Euro6 from the outset, there is no Euro5 alternative. MAN has been supplying the Euro6 TGL to the truck market since October 2013. There are three Euro6 engine specifications available, offering four and six-cylinder options. The D08.34 four cylinder in-line 4.6-litre is specified for the 10 tonne vehicle, producing either 180bhp (134kW) at 2,300rpm or 220bhp (164kW) at 2,300rpm. These produce maximum torque of 700Nm at 1,400rpm and 850Nm at 1,300-1,800rpm respectively. The six-cylinder D08.36 in the 12 tonne produces 250bhp (186kW). The gearbox, is a ZF AS Lite 6AS800 OD MAN TipMatic, automated manual six-speed, intended to offer the driver a smoother and easier gear change, particularly helpful on urban routes. The single plate clutch is a 395mm unit with asbestos free lining. MAN’s VOK-05 drop beam axle is fitted at the front and the drive axle is the HY-0295 single reduction unit. The MAN BrakeMatic braking system comes with EBS, ABS and the electronic stability program (ESP). There is no retarder option on this chassis. 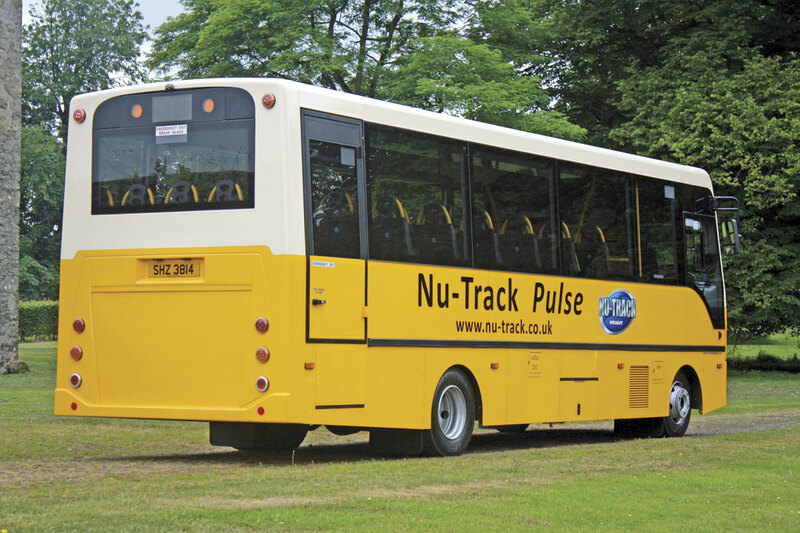 Nu-Track have retained the parabolic spring front suspension with shock absorber and stabiliser at the front and specified the optional ECAS air suspension system to the rear. ZF supply their Servocom 8095 hydraulically assisted steering system. The wheels are steel 6.75 x 17.5 inch units with 235/75R 17.5 tyres, with alloys an option. Fuel tank capacity is 150-litres as standard and can optionally be increased to 200-litres. AdBlue tank capacity is 10-litres. 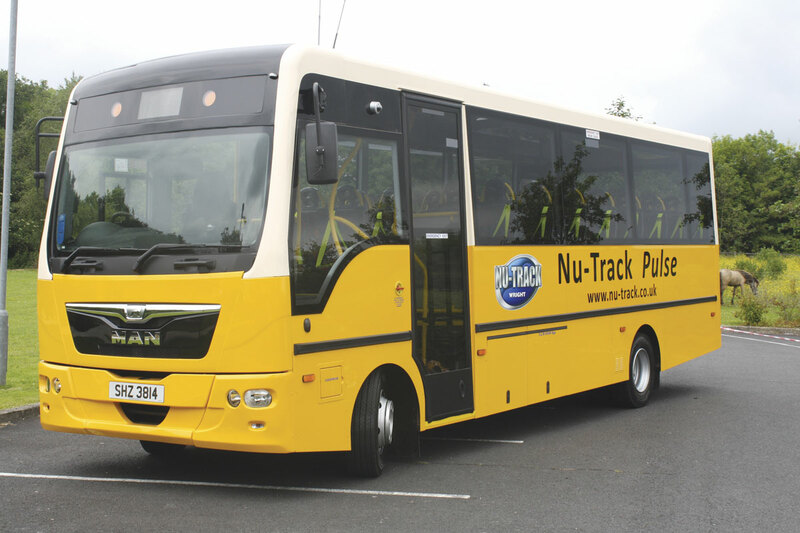 Electrically, the TGL features the MANTronic CAN bus system with central on board computer and vehicle management computer. The 24-volt system features an 80Amp alternator as standard and two 12volt 88Ah batteries, though these can be upgraded to 140Ah units. An EasyStart starting aid is included in the package. The wheelbase on the 10 tonne is 4850mm, slightly longer than the Vario, and 5200mm on the 12 tonne. The overall length is 8620mm with the width, excluding mirrors, at 2350mm. Many comparable chassis are 2400mm making them less suitable for narrow country roads. The overall height is 3100mm. It has a UVW of 6160kg with a GVW of 6580kg. Its turning circle is also better than the Vario, with a wall to wall figure of 18.2m. The high payload and body friendly chassis has been fully M3 tested and approved following a four week testing period and the MIRA proving ground. The body free chassis was loaded to gross vehicle weight and M3 brake testing was also conducted. The ESP and steering was already M3 approved. 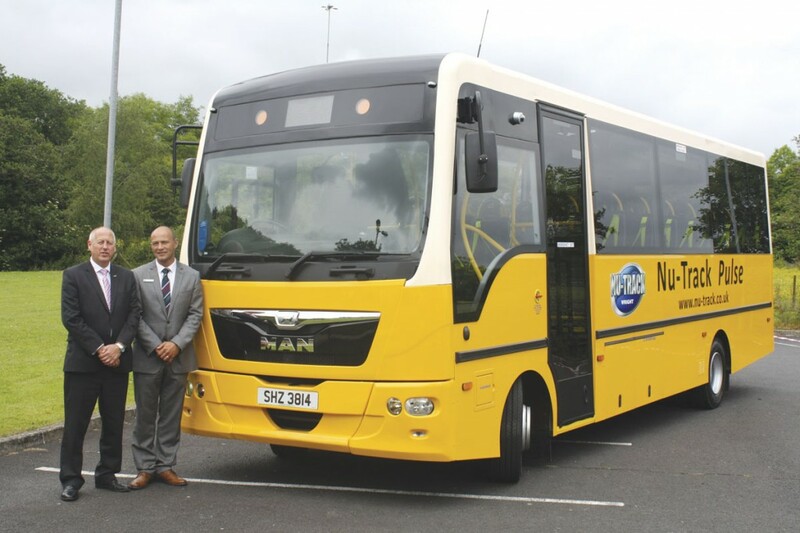 MAN claim they are the first in this sector of the market to offer a bus and coach homologated (M3) chassis. MAN’s Munich operation was heavily involved in the build specification with Nu-Track and the main modification was the air filter units. Inevitably on a truck derived front engined chassis there are compromises in the body design, as was the case on the Vario. The doorway is to the rear of the front nearside wheel and the wheelarch intrudes slightly at the lower left of the door aperture, with a corresponding cut out in the glazed plug door. Nu-Track have made quite a tidy job of the open area around where the crew seat was originally intended to be. Above the cab area, a deep boxed area housed the LED display and two flashing orange lights. One of the key features of the Pulse is the addition of quick release panels and detachable exterior side skirt panels allowing greater access for maintenance. This will increase up times and potentially reduce vehicle off road times as removable covers make standard vehicle checks easier without the need of a vehicle pit. Most of the existing MAN dashboard and switches have been retained where possible and the overall effect is one of clean efficiency. Many existing MAN components have been utilised including the driver’s seat, windscreen, bonnet, headlights and front indicators. Eberspacher’s D5 heating and air-ventilation system are fitted as standard and air conditioning is available as an optional extra. A Synectics CCTV system can also be purchased and this will be fully commissioned on-site. The cab is on a raised platform, forward of the entrance steps. It is spacious and offers good all-round visibility. Two overhead lockers to the front and off side also provide storage. A courier seat isn’t currently available but we were told one could be tailored to suit the customer’s requirements. Presumably an additional luggage storage area could also be fitted. 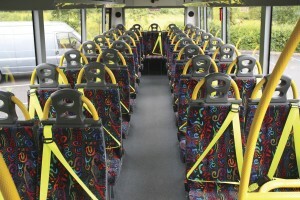 Seats in the saloon are supplied by Rescroft, but these can be changed to the customer’s specification. 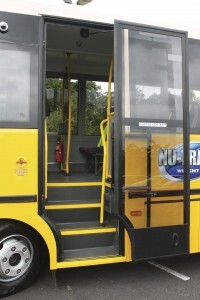 They are off-set to create a 500mm wide gangway, greater upper body space and a general, more spacious feel. The body is less angular than the Vario and there is an overall light and airy feel to it. 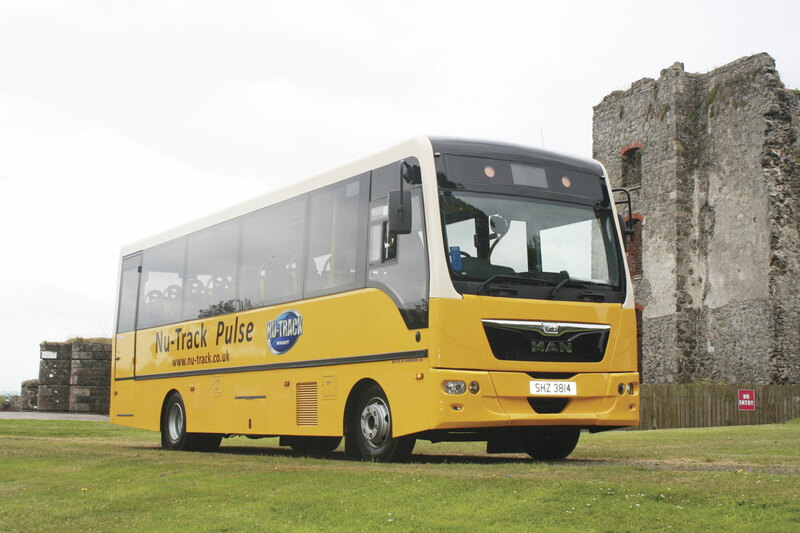 Currently, the Pulse is fitted out as a 33 seat school bus, as this is the standard class size and the same specification as the Vario. 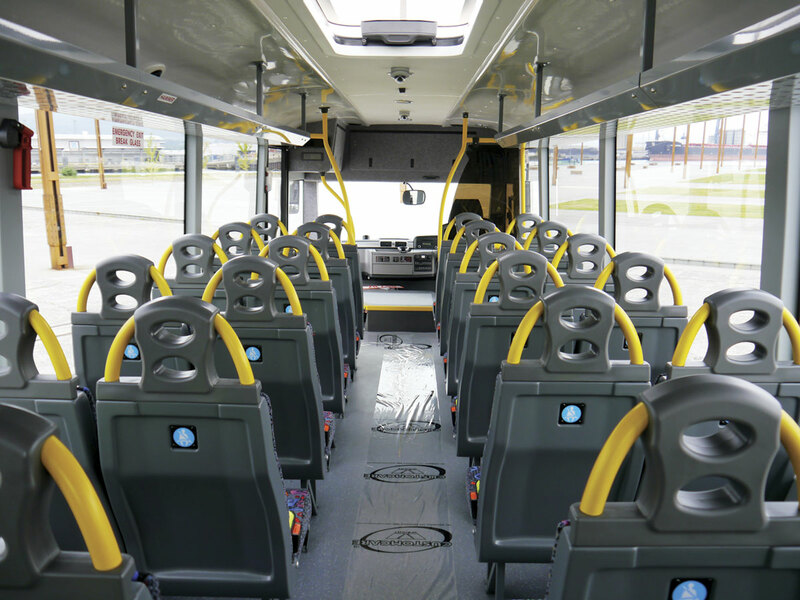 A 34 seat option can be achieved by moving the protective screen behind the driver forward and realigning the seat configuration. The layout can be easily adapted by removing the seating to make it accessible for up to ten wheelchairs. 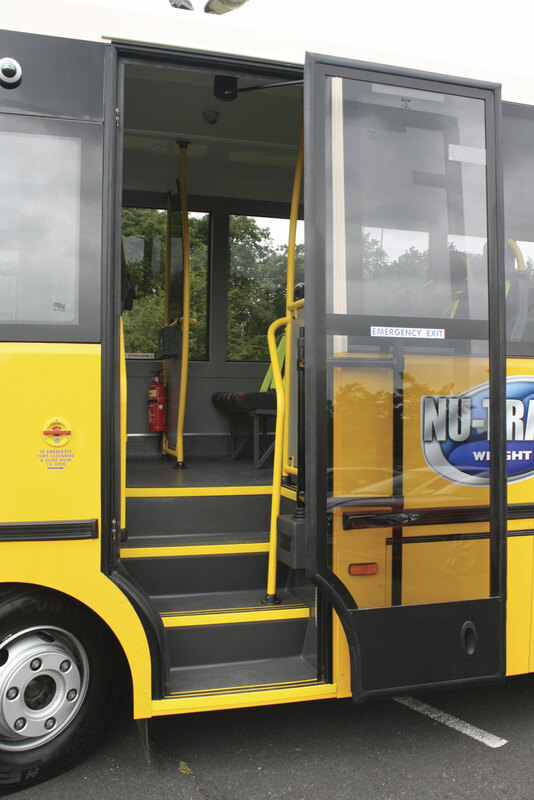 At the moment, the saloon can only be accessed by the four equally spaced steps (ground to aisle) at the entrance although Nu-Track are well advanced with the production of a rear door access vehicle complete with under chassis lift. Up to 40 seats could be attained on the longer wheelbase, 12 tonne vehicle. We were unable to drive the vehicle but we were taken out on a short trip by a company driver to a local beauty spot. What was noticeable was the feeling of space and light, mainly due to the windows which were deep and large with no columns to break visibility. Despite the interior having to serve a practical, low maintenance purpose, it was still bright and cheery. Legroom was sufficient and the seat was comfortable. All the seats were fitted with bright yellow three point safety belts and a fasten seatbelt alarm sounded before setting off. 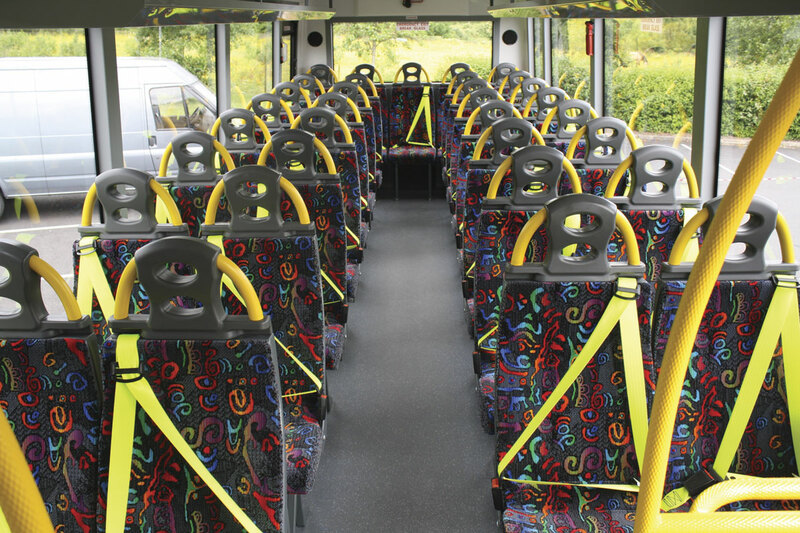 Deep, overhead metal racking ran both lengths of the bus allowing useful space for school bags and sports equipment. 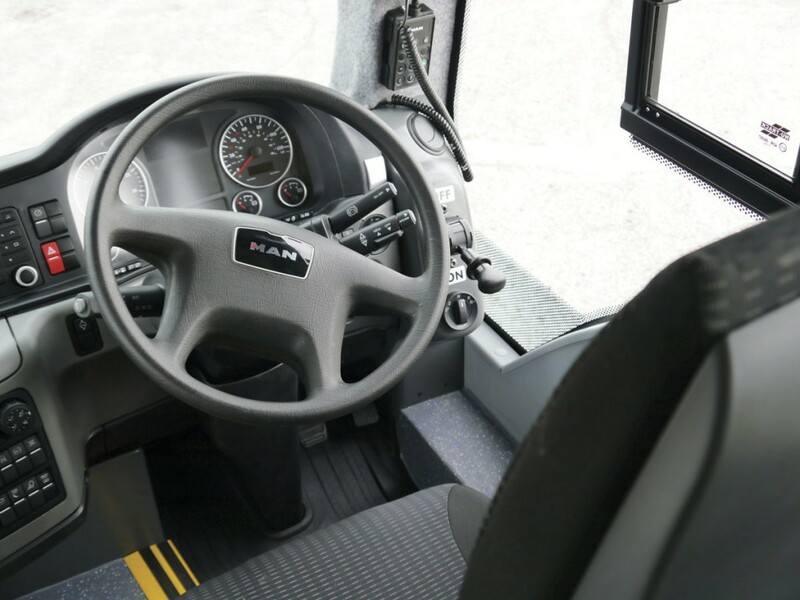 Safety features were clearly displayed with two stop buttons on the ceiling, clearly marked break glass and emergency exits, bus stopping illumination signs and an audible vehicle reversing warning. The emergency door is at the very rear of the offside. For ease of cleaning, curved moulded sections run from the floor up the side walls. The ceiling is similarly easy to clean, as are the plain moulded seat backs. 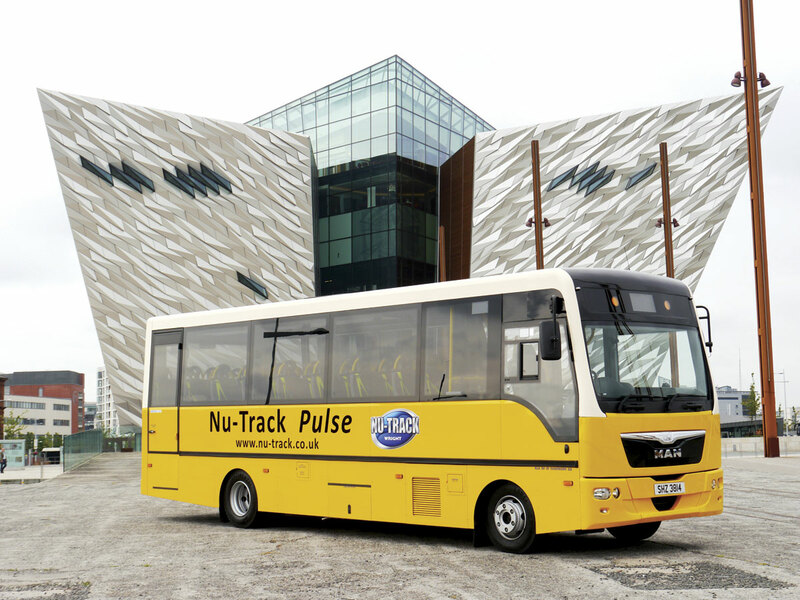 Nu-Track were reluctant to discuss their order books, but what was apparent is that they are targeting the Northern Ireland Education board who currently order 40-50 units per year. They are also presenting to councils and local authorities in the hope that it will become a dual purpose vehicle and it could be easily adapted as a mobile library, a market in which they have experience. The UK is their core focus and they are trying to infiltrate London and the South East, with a dedicated sales person already on board. 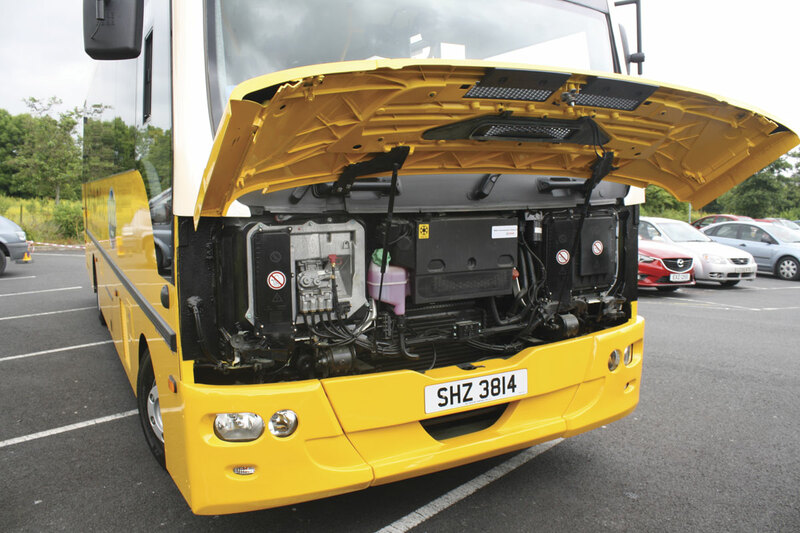 They are also currently looking at Europe and they can distribute internationally through the Wrightbus network. The possibility of producing a low-end, semi luxury vehicle for the private sector was also mentioned. No boot or underfloor luggage lockers were fitted but the design would easily accommodate them, indeed the rear moulding appears to have been designed with this in mind. The predicted production is four vehicles per week with a lead time of 12 weeks from receipt of the chassis. Pulse is one of four development projects for Nu-Track in 2014. Pulse customers can choose from a variety of financial services from the MAN Finance range including flexible finance solutions. They have four levels of service contracts, gold, silver, bronze and a pay-as-you-go option which are available from the nationwide dealer network. As well as finance and aftersales, MAN can offer a range of services to the end user, including their vehicle driving monitoring system, MAN Ecostyle, as an extra. This telemetry reporting system offers track and trace vehicle tracking, forward facing camera integration, incident data recorder and a document database. It is available by monthly subscription and is currently running on over 8,000 vehicles in the UK. The reporting system is designed to help reduce costs and increase fuel economy by reporting on driver habits such as use of cruise control, harsh acceleration and braking, gear use, speed and engine idling. A document database assists with vehicle compliance, allowing easy access to important documentation whilst the in-cab camera records incidents and reduces the risk of claims.